Showing results for tags 'reds'. It was all about variety yesterday in the ENP. 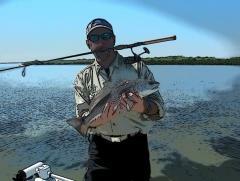 We launched early at OR (with 25-30 others from the Naples area who were entered in a Red/Snook tournament). Low tide at 6:43 a.m. so we would have incoming water all morning followed by a falling tide in the afternoon. Weather was overcast, but nice. Winds were calm. Fished with my buddy, Mike (InTheSlot12), who was injured in a boating accident back in June. This was his first time on the water since then. We caught just about every species--reds, snook, trout, jacks, ladyfish--but the capstone was this large tarpon that we caught at the end of the day along a shore line on the incoming tide. Most of the catch was on hard plastic sinking twitch baits or soft plastics. The tarpon ate a soft plastic jerk bait. I lost one after one jump that took a purple DOA Baitbuster; that would have closed the inshore grand slam for me. But Mike brought it home for the boat grand slam! The day would not have been complete without spending some time with Ranger John Kalafarski to hear his stories about snook otoliths, the importance of no see ums (ceratopogonidae) to the chocolate industry, and this Burmese Python skin.